HTC DROID DNA review: The Android Phone You've Been Waiting For? 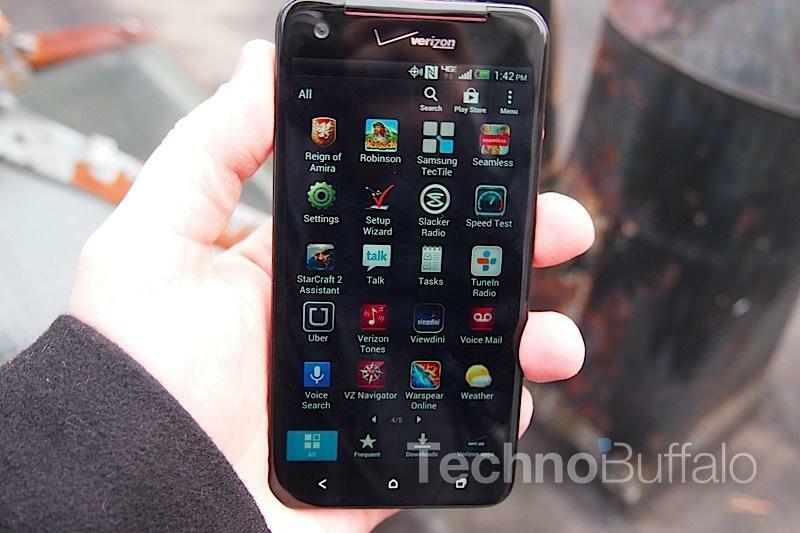 Verizon's DROID DNA was rumored long before its release. In fact, I joked a bit with the PR team before it was launched about how we all knew the 5-inch smartphone was going to be announced earlier this week. I've had the review unit for a few days now and have had a chance to run it through my regular paces. It's a fantastic device with some distinguishing features, and its 5-inch display actually doesn't feel too large. Let's dig deeper now. As far as Android smartphones go, the DROID DNA has it all. It's packed with the same killer 8-megapixel camera we saw in the HTC One X, the latest quad-core Snapdragon S4 pro processor from Qualcomm, a wide-angle front-facing camera that we first saw on the Windows Phone 8X, Beats Audio, 2GB of RAM and more. But it also has two hardware specs; one good and one great, which really stand out. First, it has a super sharp 1080p HD display, the first of its kind in the U.S. market, with a pixel per inch count of 440. That's sharper than any other smartphone you can currently buy. But the phone only comes with 16GB of storage. That's fine if you're a cloud-based kind of person, the industry is certainly moving that way, but it's not much storage. That's especially true if you actually want to take advantage of the 1080p display by storing full HD videos on your phone. It seems so silly, but I've learned that Verizon was the one who didn't want the additional storage, for whatever reason, so I can't ding HTC for that hardware mishap. HTC has long built its Verizon DROID-branded devices with a focus on making them to look somewhat like a sports car, and the DNA is no different. It has red "racing stripe" mesh running down both sides, but don't let that mislead you, these aren't speaker grills. 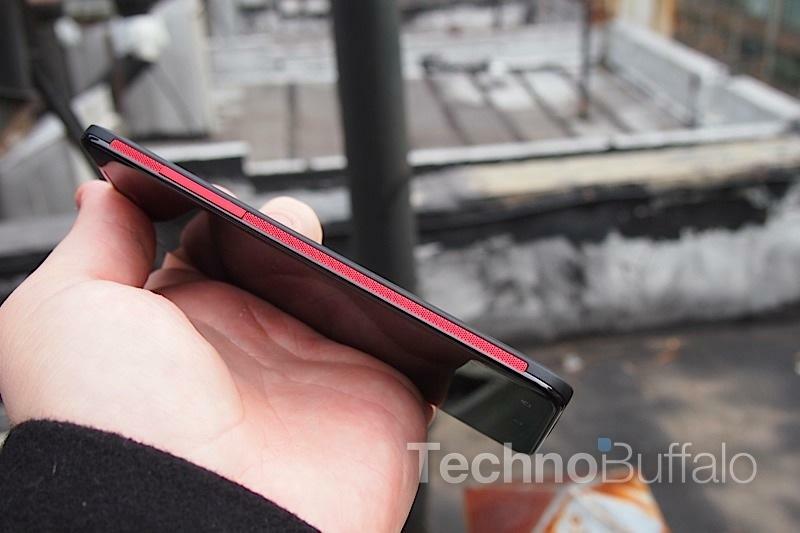 There's also a small red ring around the 8-megapixel camera, a red power button at the top of the phone and red brushed aluminum volume buttons on the right side. There's also a 3.5mm headphone jack on top, flanking a small miniSIM port. The microUSB charging port is on the bottom of the phone and has a super annoying hatch protecting it. The device itself is built out of polycarbonate plastic and has a unibody design, which means it feels absolutely solid and there aren't weird hinges or plastic plates popping off of the phone. Back to that 1080p display for a second: it's stellar; text is noticeably much crisper than what I've seen on other smartphones, especially while reading websites or books. It's also really bright and easy to read under direct sunlight, since it utilizes LCD3 technology instead of Super AMOLED. The viewing angles totally rock, too. You can see the screen from nearly every angle with ease. 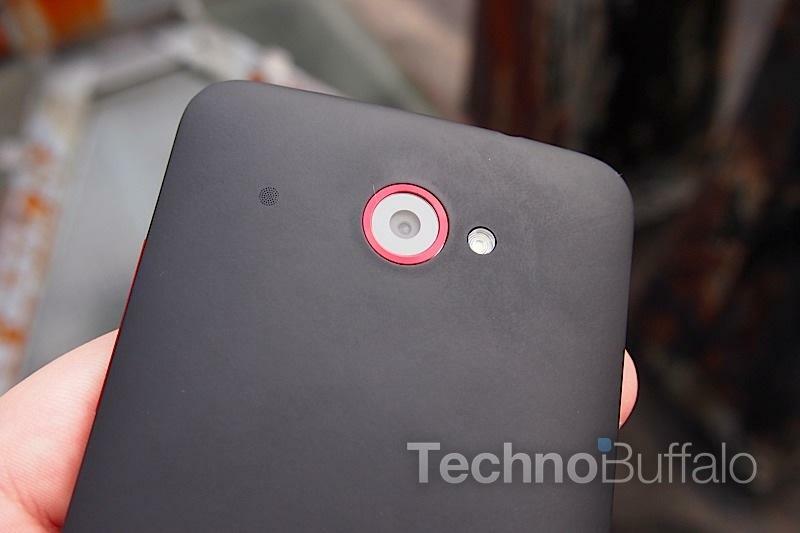 Lastly, there's a small looking grill on the back of the phone that's super hard to notice without looking for it. This is actually an LED indicator, although it's basically completely useless. I'm not sure why it was put on the back of the phone instead of on the front, and it lights up green – just barely bright enough to see – when a new message, call or email comes in. 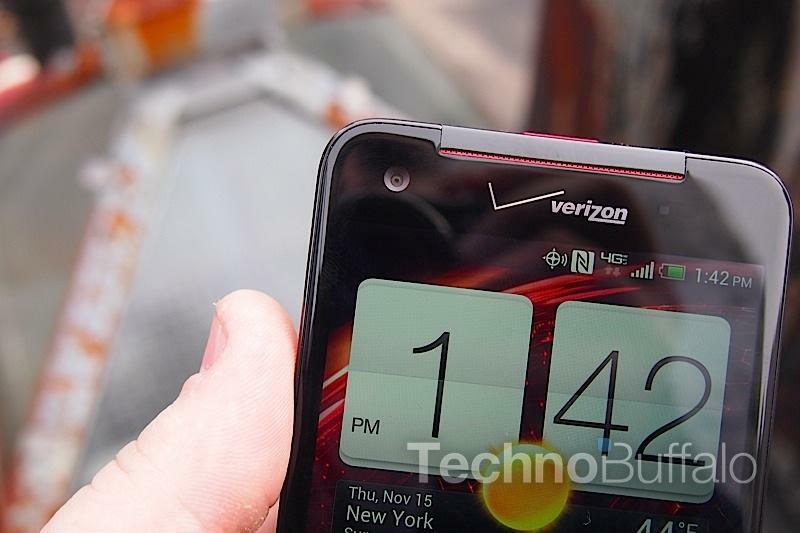 Again, I have absolutely no idea why HTC decided to put the notification LED where it is. As far as Android smartphones go, the DROID DNA has it all. I ran the full Quadrant benchmark, which we usually do for all high-end Android smartphones, to see how that Qualcomm Snapdragon S4 Pro processor stacked up against the competition. 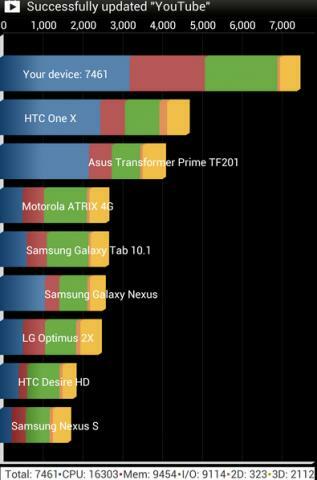 The DROID DNA received an overall score of 7,461, which blew the HTC One X out of the water. It also bested the ASUS Transformer Prime TF201 and several other devices. Keep in mind, too, that the quad-core processor has to be able to render every single pixel on the display, which really puts a toll on how well it stacks up against other quad-core phones. Basically, it looks like you're future proofing yourself with the DROID DNA when it comes to more power intensive apps and games that are no doubt going to launch in the coming year. 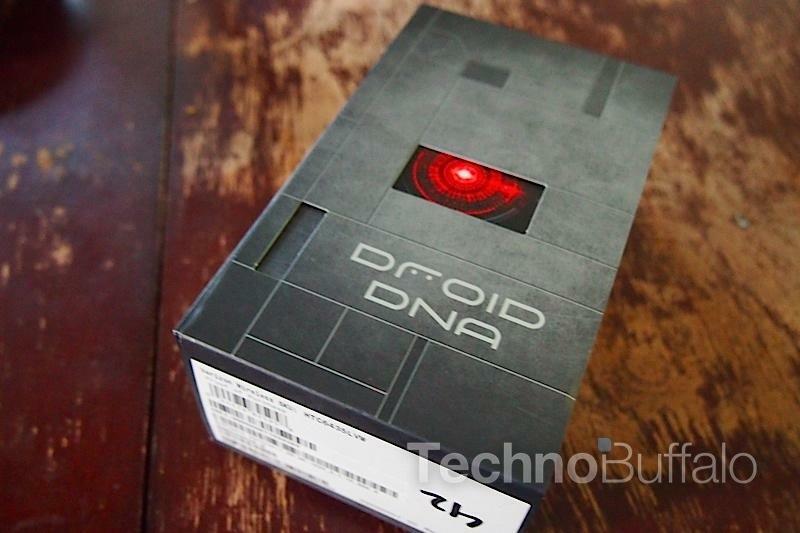 Finally, before I forget: the DROID DNA is a global smartphone and ships unlocked. That means you can actually pop in an AT&T SIM card and use HSPA in the United States and even T-Mobile's EDGE network. You probably won't want to, especially if you buy it on a contract, but it's nice to know that the device is completely unlocked out of the box. Stop worrying about an upgrade from Ice Cream Sandwich to Jelly Bean. The DROID DNA runs Android 4.1 Jelly Bean out of the box, which means you get buttery smooth performance, amazing Google Now support and the option to use your voice for Google's incredible Google Search engine. HTC also slathered on its own HTC Sense 4+ user interface, which has a few design tweaks over the Sense 4.0 skin that launched on the One X. The keyboard has been changed a bit, which takes some getting used to if you're already using an HTC phone, but it's still a breeze to type on. I also love that there's a "settings" button right in the notification shade, which makes it easy to quickly jump in and turn off GPS or connect to a Wi-Fi network without having to dig through menus. Sense has long been one of my favorite Android user interfaces. TouchWiz is great, but it's a bit too colorful for me and I like how clean Sense 4+ looks on the phone. Obviously others do, too. Its weather widget has been widely copied on tons of third party applications. My only beef with the current UI setup is that there's a small tab on the bottom right-hand side of the main menu for "Verizon Apps." I suppose this is good for Verizon subscribers that are new to smartphones and don't know what their phone is capable of, but it's loaded with bloatware including VZ Navigator (Verizon needs to kill this on Android), Amex Serve, My Verizon Mobile, Verizon Tunes, Viewdini, a game demo for Reign of Amira and visual voicemail. NFL Mobile and Slacker Radio are welcome, since I imagine plenty of consumers use those applications. Sense 4+ also allows you to manage multiple photo galleries across third-party applications. So you can view the photos stored on your phone as well as those from Microsoft SkyDrive, Dropbox, FaceBook, Flickr and Picasa. Similarly, and we saw this in Sense 4, the Beats Audio support is integrated with third-party music applications such as Spotify, which appear under the music menu. HTC also has a photo map, similar to what you have on iOS, which allows you to see where you took your photos. If I was on a trip to Berlin and snapped a couple of photos at Checkpoint Charlie, for example, I could come home and see exactly where I snapped the photos. I love this sort of feature, although I rarely find myself using it. But hey, it's a free addition, right? HTC really put a focus on camera quality when it introduced the HTC One X, which remains one of my favorite mobile cameras to date. 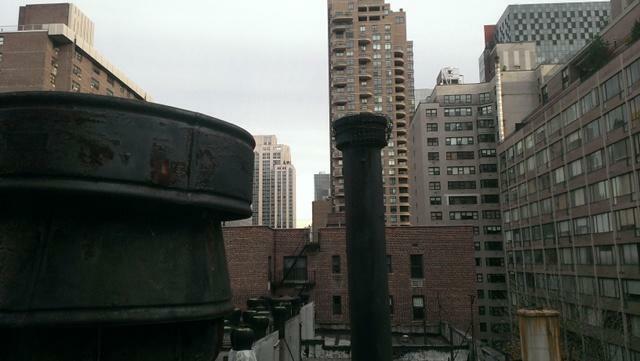 Like that phone, the DROID DNA can snap photos in rapid fire. And I mean super rapid: HTC said that it changed the default settings to save just 20 pictures while snapping quickly, instead of 99, because users were snapping so many photos so quickly that they were consuming tons of space. You can always adjust that setting, however. I also love that you can take pictures while recording video. So if you're at a baseball game and are trying to film a home run, you can quickly snap the shutter button to grab photos right as the batter swings. Pictures were right on par with what I saw with the HTC One X. I generally think they're pretty close to what I receive on the iPhone 5, too. Colors look good, the flash doesn't blow too much of the image out and the images look fantastic on the 1080P screen. Likewise, the phone is capable of recording 1080p video and, for the first time, you can actually view it back in its 1080p glory right on your smartphone. Pixels count, and while it might be hard to distinguish with the naked eye all the time, you can tell that everything always looks incredibly sharp. Calls on the DROID DNA were solid and on par with what I've experienced from HTC's other smartphones. I wasn't overly blown away, but I didn't have an issue with background noise and callers said I sounded just fine during several test calls. I used the DROID DNA's speaker phone while calling FedEx and found that the rear speaker was a bit watery, even though I could still make out what was being said. The caller didn't seem to notice that I was on a speakerphone, which is good news. Like other HTC phones, you can leave the phone facing down and then pick it up to automatically turn off the speakerphone function. 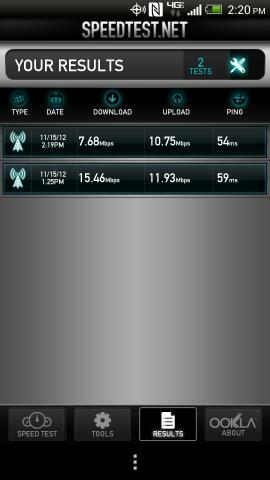 My data speeds were solid and usually fell in around 15Mbps on the download side and close to 12Mbps on the upload side. Those are sufficient enough to compete with entry-level home Internet connections and are speeds that I typically see from Verizon's 4G LTE network in New York City. The DROID DNA features a 2,020mAh battery, which was able to get me to the end of the day with about a 30 percent charge. That's OK in my book, since I usually only dock a smartphone if it can't make it through a full day on a single charge. Again, it's a bit surprising considering the size of the screen and the amount of power under the hood. I have to be honest with you, that's why you're reading our review in the first place. 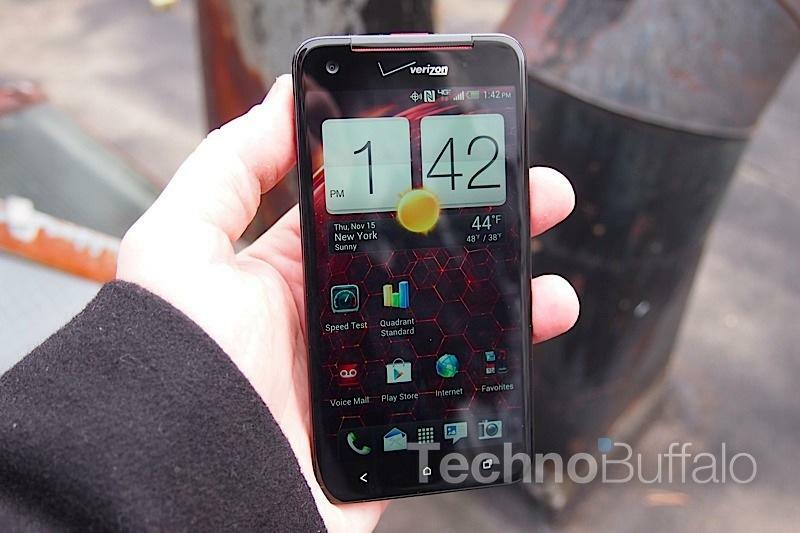 I'm head over heels for the HTC DROID DNA. It offers everything I want in a modern smartphone, including solid battery life, excellent data speeds, a super fast quad-core processor, a big and bright 1080P display and a great camera. Android 4.1 Jelly Bean totally rocks, too; it's the best version of Android I've ever used aside from the slightly updated Android 4.2 version, which isn't exactly mass market yet. But I'm so hung up on the fact that it offers 16GB of storage. 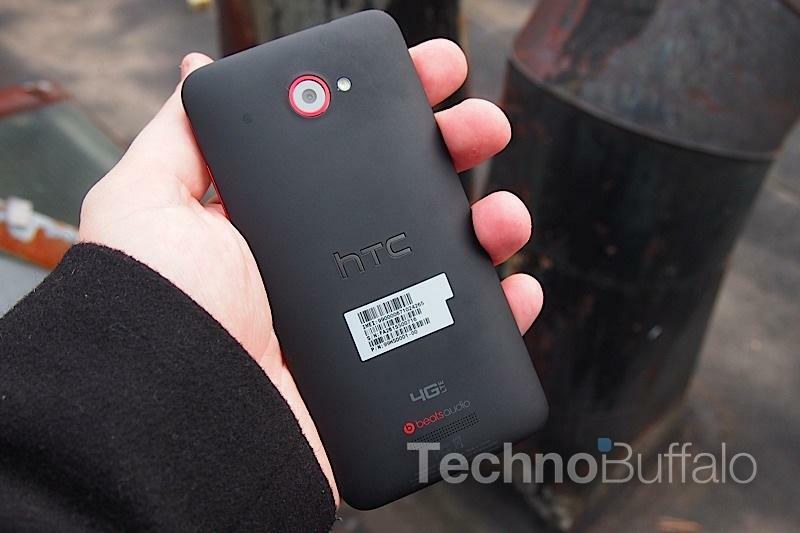 I can't dock HTC, I know it wasn't the company's fault and, if it had its way, we'd have a 64GB model. But that's a huge factor for me, especially because I like to carry every single picture, movie and song I've ever downloaded on a device. Sometimes I'll sacrifice to a 32GB phone and skip a few movies, but 16GB isn't enough for all of my songs and photos. If it had 64GB of storage, I'd recommend it over the Galaxy S III without question. But it doesn't. It has tons of other redeeming qualities that make it a similar option; you just have to deal with the storage problem. That's the only reason I'm docking it a full point below perfect, otherwise I envy anyone picking up a DROID DNA in the near future. P.S. – Stay tuned for Jonathan Rettinger's video review, which will be published shortly.